“It turned out to be one of five U.S. Army medals inside — the Purple Heart, a Commendation Medal, a Good Conduct Medal, a National Defense Service Medal, and a Vietnam Service Medal,” said Carl Blasingame, 38, who purchased the storage unit. His first instinct was to find the rightful owner of the commemorative war medallions. Last week, he told the Waco Tribune-Herald the laundry basket also contained U.S. Army ribbons and paperwork showing the medals were reissued to Thompson in 2016 and shipped to an address in East Waco. Blasingame, an admitted history buff, actually acquired the unit for $50 because he was interested in two antique bar stools it contained. However, the Purple Heart took him on a new journey and he was intent on finding Thompson. 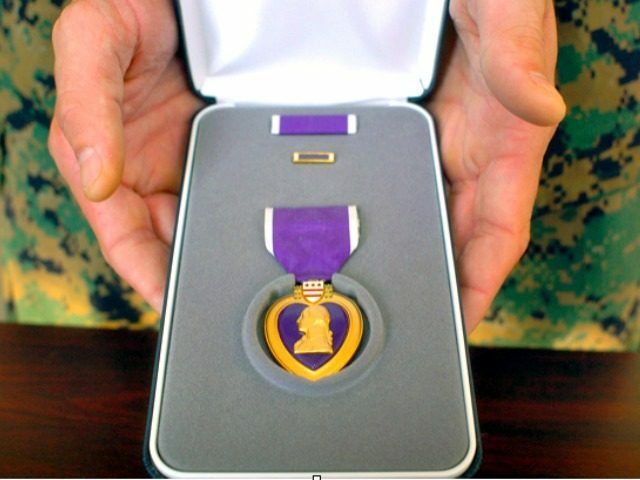 Blasingame consulted Major Zachariah Fike, founder of the nonprofit Purple Hearts Reunited, which aids individuals in the recovery and return of lost or stolen military medals of valor to veterans and/or their surviving family members. “I really want these medals to go home, because if these were related to my grandfather, I think it would be important to me to just get them home,” said Blasingame. He did not have to wait long. On Monday, one day after the Tribune-Herald ran the article about Blasingame’s search for the owner of the Purple Heart, he located Thompson. The 72-year-old Vietnam War veteran resided in Waco. Then, on Tuesday, Blasingame delivered the five medals and paperwork to Thompson in his living room. Thompson said he lost the original medals in 1995 when his Temple home was burglarized. Several years ago, he and wife Margret moved to Waco to be closer to the Doris Miller Department of Veterans Affairs Medical Center. According to the Tribune-Herald, Margret reordered the medals when the couple first relocated in East Waco, but they later moved to another section of the Central Texas college town and they never received the reissues. Neither Thompson nor Margret had any idea how the medallions wound up in an abandoned storage unit. Thompson explained he shipped off to Vietnam at age 20. It was 1967. He recalled a particular wartime event in 1970 that likely played a role in the U.S. Army later awarding him commendations for bravery and valor. He was hit in the leg by shrapnel while attempting to get to a tank amid an unexpected attack. Despite having burning shrapnel embedded in one of his knees, Thompson climbed into the tank, turned on the radio, and apprised other soldiers on the battlefield of the ambush. He served in the military until 1971, according to the Tribune-Herald. “This is the first time I’ve ever seen these and it’s very exciting,” said Margret. She told Blasingame that Thompson was “so excited” he could not sleep the night before. “I am very proud of him,” she added.